Just like your career is a normal part of your day, allergens in the workplace are also a constant. You probably sit at the same desk every day for a majority of those working hours, and breathe in the same circulated air that all of your coworkers are sharing. Allergens at work can be a nuisance to deal with, but there are ways to reduce those allergens and make the air you breathe more comfortable. Circulated air, especially in office buildings, can be a source of countless germs and allergens just waiting to strike your sinuses. Put an end to those allergens by checking into your office’s air filters and finding out the last time they were replaced. Make sure that the filters are being changed monthly to ensure optimum protection for you and your coworkers. Also, don’t forget your carpet is your largest air filter. Be sure to have your carpets professionally cleaned at least once per year. You probably haven’t reached behind that filing cabinet for quite some time, meaning there are allergens piled up from all sorts of seasons past. Grab a damp rag and dust around your office to remove any build-up that could be contributing to your allergies, and then repeat the process once weekly to keep the annoying particles under control. Adding some greenery to your workspace can help to not only liven up the room, but also purify the air that you breathe. Invest in a simple to care for plant, like the Dracaena, and you will be breathing easy within a week. Sometimes the best way to reduce allergens is to take a break from them. Clear your head (and sinuses) by taking a short ten-minute walk outside each morning and each afternoon. Sure, there are allergens outside too, but the fresh air you get from the walk will help rejuvenate you to fight the indoor pollutants you face at your desk all day. Indoor allergens can be a hassle when you need to get work done, so take steps now to help cut down on current lurking pollutants. 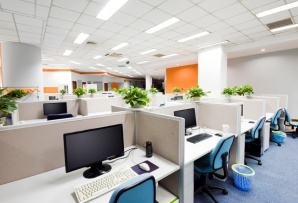 Also consider hiring a professional like Zerorez to give your office the deep clean it deserves, and give those allergens the kick they need to get lost once and for all.